Graux studied singing at the Conservatoire de Lille under Alphonse Capon. After the war, where he was wounded, he was admitted to the Conservatoire de Paris (1920). Probably he made his debut at the Grand-Théâtre de Nancy, he was very successful. He made guest appearances at the Grand-Théâtre de Bordeaux, l'Opéra de Lyon, le Casino municipal de Cannes, l'Opéra de Monte-Carlo. 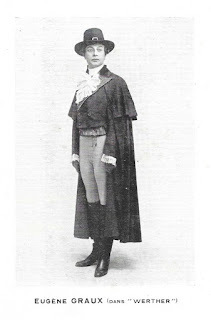 In 1928 he made his debut at the Opéra-Comique in Paris as Gérald in ‘’Lakmé’’ (1928). In 1931 he was appointed professor of singing at the Conservatoire de Lille. He never made records.